southern orders : HOLY COMMUNION ON DEMAND, FAST FOOD STYLE! I listened to XM Catholic Radio, Seize the Day briefly this morning. The host, Gus Lloyd, mentioned that his wife had been sick at home and could not attend Mass. So Gus went on his own and asked the deacon after Mass if he could bring Holy Communion to his wife. The deacon happily obliged. Communion on demand, is this what we have come to? Okay, I am prejudice. When I was a child and many other children and adults did not receive Holy Communion each week, usually very seldom and only after having gone to confession. Yes, this was an extreme but it was my Jansenistic parish's reality. At that time, Holy Communion apart from Mass was only for shut-ins, those dying (viaticum) and for those in the hospital. Today, if a priest is not available for daily Mass, a Communion Service is held. If a daily communicant is sick for a day with a hang nail, another communion minister brings that person Holy Communion. Communion on demand--is there a problem with this? And why aren't bishops raising this issue, only a lowly priest waiting for the rapture on my day off with horrible weather outside making me think the rapture would be better than this weather! No you're not. You're prejudiced. "...his wife had been sick at home and could not attend Mass." Holy Communion apart from Mass was only for shut-ins... well, sick at home...shut in...? "When I was a child and many other children and adults did not receive Holy Communion each week, usually very seldom and only after having gone to confession." This is a sentence fragment. Try adding a clause that contains some form of a verb. Thank you for taking the time out of your undoubtedly busy day to share your priesthood by posting on your blog. Perhaps you were hurried trying to provide us with new material to read and discuss and didn't have much time for proof reading. Despite this, I understood your posting perfectly and maturity leads me to overlook any grammar/usage concerns and focus solely on the material you provided for consideration. I think reducing the holy gifts to something you would put in a child's lunchbox is a terrible idea. It has the appearance of the yogurt containers in my refrigerator. How would you repose these should they all not be used? How would you properly purify those cups that were used? Our tradition allows for communing the sick, the dying and shut-ins via hosts in a pyx carried in a burse secured around one's neck. This seems sufficient. 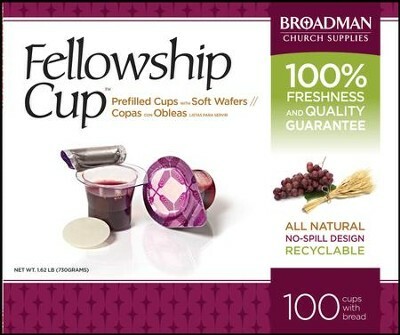 This method seems best left to protestants in keeping with its labeling, "Fellowship". So, clear, unambiguous communication from Pope Francis is what many here clamor for, but when the blog owner can't put together a basic compound sentence, the "mature" reader govs him a pass. Pope Francis being ambiguous and a few typos/usage concerns are two very separate matters. Keep in mind, Fr. does not have to continue offering this blog. I and I'm sure many others here are grateful that he does after so many years. "But when the blog owner can't put together a basic compound sentence". Rather broad brush when, clearly, past postings have demonstrated that indeed he can. Last, "the "mature" reader govs him a pass". Yes, maturity allows me to look past this, and not take the tactless route pointing it out as I perfectly well understood his intent. I, therefore, "gove" him a pass. Please consider your option of not reading this blog. Maturity seems to come into play very selectively for you. It allows you to give the blog owner a pass, but for others, not so much. No. I apply maturity in a fairly consistent fashion. For example, maturity leads me to conclude that we have spent far too much time discussing that which is of minimal importance in the grand scheme of things. So, here it ends for me.